Creamy, smooth, perfect hummus, the kind you get at your favorite Middle Eastern restaurant, bears little resemblance to the tubs you buy at the grocery store, or even make at home using canned chickpeas. With a little planning ahead, it's easy to make perfect hummus at home. The secret to making the best tasting hummus is to start with dried, not canned garbanzo beans, which require soaking. 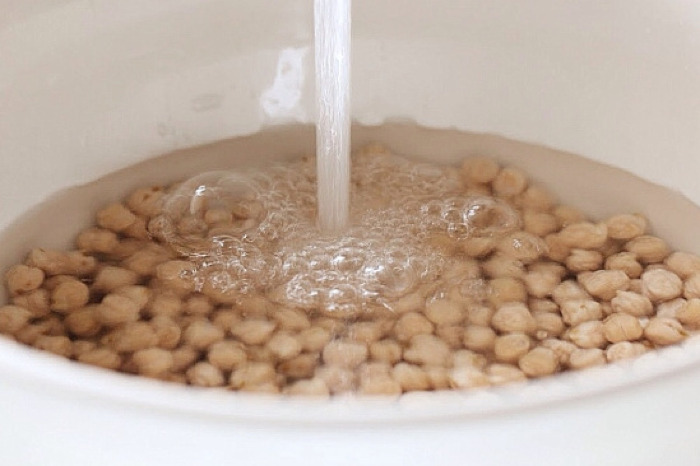 In a large bowl, add enough cold water to cover the beans by 2". Set aside overnight, or for at least 6-8 hours. Drain water and rinse beans. They are now ready to cook. Fill a pot with 6 cups cold water and add beans. Simmer gently covered with lid ajar for about 45 minutes to 1-1/2 hours until beans are very tender, almost mushy. Add additional water as needed to cover. Purée beans in the bowl of a food processor, adding a little of the reserved water if necessary. Then add tahini, garlic, salt, cayenne pepper, and lemon juice. Process for about a minute, then with machine still running, add olive oil in a stream. Add the reserved cooking liquid a little at a time until you’ve reached the desired consistency. Serve with carrot and celery sticks, olives, and pita chips.